There are several different ways to go about Form Creation in Zend Framework 2. This article will focus on extending the Form class and using a form in the ZF2 Skeleton Application. Assuming you have already created a basic module, you should be ready to start creating a form. To start with, create a Form/ directory in module/[Your_Module]/src/[Your_Module]. Usually the class name given will be related to the type of form you’re looking to build. In this example, a simple register form will be built. The form class must extend Zend\Form\Form and any elements added to the form must be added within the class’ __construct() method. 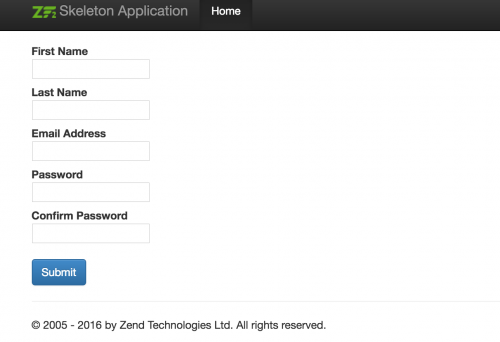 Form elements can be added using the add() method of the Zend\Form\Form class. ZF2 uses its own classes for input types i.e. Zend\Form\Element\Text. There is also a Zend\Form\Element\Email class to use with email inputs. Use the Zend\Form\Element\Password class for password fields. Usually with register forms, a password and a password confirmation field are present. Web forms can be susceptible to cross-site request forgery (csrf) attacks. Fortunately, Zend Framework provides us with a Zend\Form\Element\Csrf to use in our forms. Lastly, a submit button is required in order for users to be able to submit the form. Within the IndexController class, import your form class using the ‘use’ keyword. You can then pass the class instance to an array when returning a new ViewModel instance. In the view template, the form can be accessed using $this->form as the ‘form’ key was defined in the array when instantiating a new ViewModel class. To render the form opening and closing tags, the form view helper, $this->form() is used (not to be confused with $this->form). When you refresh your application, you should see the form rendered on your designated module’s URL. Currently the form doesn’t go anywhere, nor does it have any validation. Using the Input Filter will be covered in another post.